Getting started with NordVPN for Linux couldn’t be easier. Install the app, enter your login details, pick a server, and you are all set! No graphic distractions, only the power of your commands. Connect to servers, list countries, or switch between protocols, all with a command line. Cloak your virtual identity in no time – just type nordvpn connect, and the special algorithm will connect you to the best server available at the moment. No content restrictions, no speed or bandwidth limits – choose any server to enjoy secure and private browsing experience. NordVPN secures your sensitive data with military-grade encryption, so whatever you do online stays secure and private. If your VPN connection drops, Kill Switch will block your computer from accessing the internet outside the encrypted VPN tunnel. The CyberSec feature guards you against malware and other cyber threats. The autocomplete widgets are there to make your VPN experience even better by providing you suggestions while you type your commands. Easily switch between the internet protocols depending on your requirements for connection speed (UDP) and level of security (TCP). Need assistance? 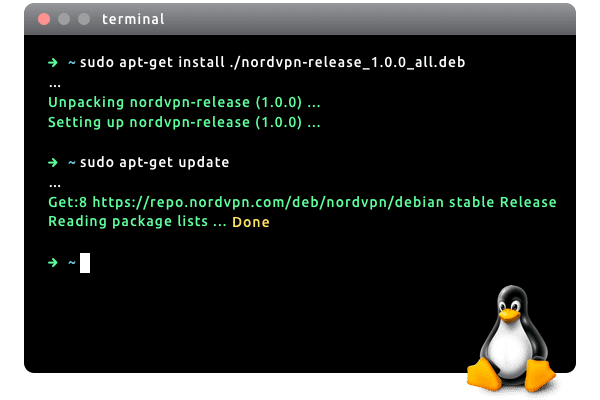 Visit our Help Center for more information and step-by-step instructions on how to set up NordVPN on Debian.